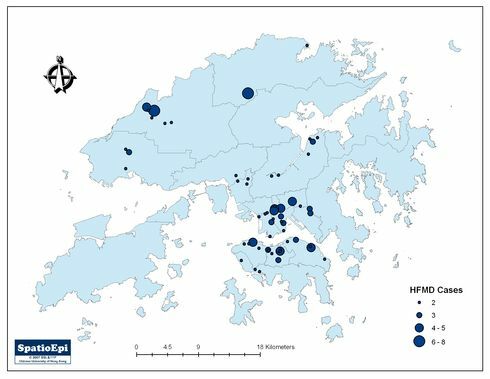 The number of reported Hand, Foot and Mouth Disease (HFMD) institutional outbreaks in Hong Kong in the first seven months in 2010 has exceeded the annual record in the past decade. HFMD activity peaked in June and declined afterwards. 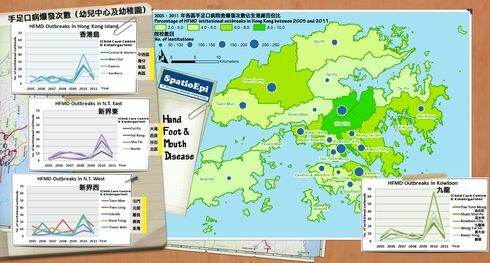 The map shows the distribution of institutional outbreaks of HFMD in Hong Kong in June and July, 2010. As depicted by graduated colours, a very high percentage of institutions in Wong Tai Sin in the heart of Hong Kong reported outbreaks. Only a relatively small proportion of institutions in Yuen Long, Tuen Mun, Tai Po and Islands had experienced outbreaks . The bar charts show the type and number of institutions with HFMD outbreaks by district. Child care centres and kindergartens accounted for 66% of all outbreaks. The spatial distribution of the outbreaks differs somewhat from that of 2008. Data were compiled from the daily reports of the Centre for Health Protection, Department of Health of Hong Kong.